On this tour, we will discover the Ladakh and the Nubra valleys, which have been a crossroad for commercial activities between India, Tibet and Central Asia. Those two valleys are linked together by the highest motorable roads in the world, passing over the Khardong la pass at a height of 5400 m. In Ladakh, we will discover the ancient kingdom of Sham, the main Ladakh monasteries and the wonderful sites surrounding them: Shey, Thiksey, Hemis, Spitok, Phyang, Lamayuru and Alchi… The second valley was an important stage for caravans following the Silk Road, which where swapping their mules for the famous camels of Bactriane. It is only since 1995 that the restricted area of the Nubra opened its doors to foreigners. Lying approximately 400m lower than Leh, Nubra sports a much milder climate, which enables its inhabitants to cultivate more extensively, as compared to their counterparts in the main Indus valley. 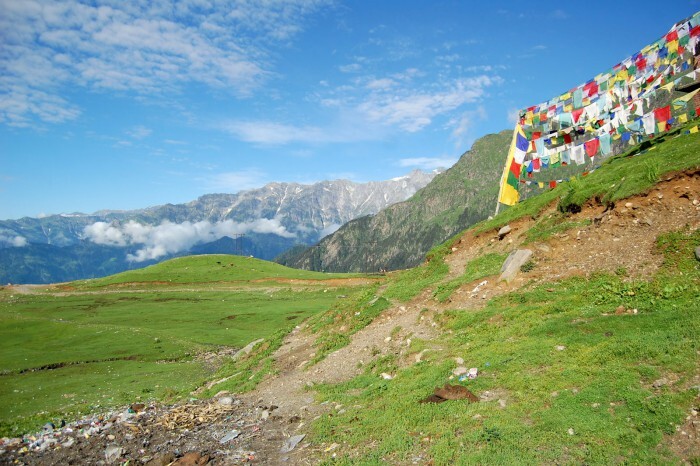 We will continue our journey south, through wild landscapes, high passes (2 above 5000 m) towards Dharmashala a tiny Tibet perched at hillside. DAY 01: Arrival Delhi, transfer to hotel. DAY 12: Drive to Manali, hotel. DAY 14: Drive to Dharmashala, hotel.